I was excited to embark this particular morning on a trip that I had planned in secret for my wife. She knew when we were going on vacation but did not know where we were going. It was a trip comprised of a couple firsts. Our first trip as a married couple (outside our honeymoon of course) my first trip to the North Coast and my first trip shooting with a 35mm prime lens. Leaving on a Friday worried me a bit that we would be hitting commuter traffic into San Francisco so we departed at 9am and avoided most of it. Once we hit Cloverdale off the 101 we headed due west up Hwy 128. A surprise was lying in wait for us on this highway, our first look at the giant redwoods that the north is known for. 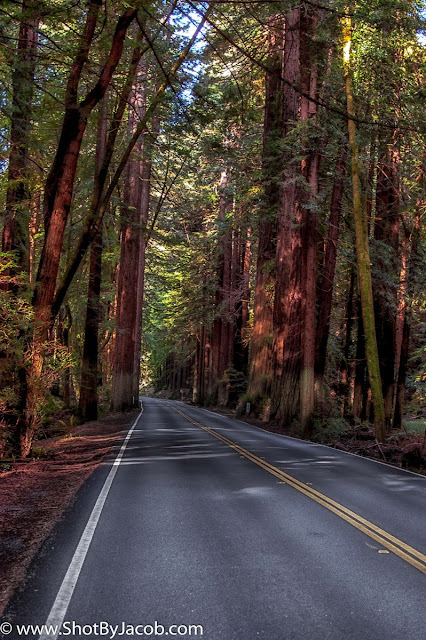 Like a torrent sweeping across us we drove into a dense grove of the tallest trees I had ever seen. The redwoods were upon us and there was no escaping the wooden citadels that were choking the light out of the sky. A small but none the less thrilling sense of wonder danced in my mind as we drove deeper into the grove. The light changed so quickly that I had to increase focus as my eyes needed to adjust to the light that so quickly left us. As if the giants were beckoning us to come and play we pulled to the side of the road and got out to explore. The densely padded brush muted and dampened every stride that took us further from the pavement. The few cars that passed were reticent, as if the sounds ran straight into the tall trunks and drowned. The forest danced with a golden fragmented light that pierced the soaring canopy and lit the floor alike brilliant fire. There was a peaceful serenity in the landscape that enchanted us. After taking in the moment we headed back to the car, got in a drove away from the friendly giants. Our first breath of crisp ocean air was not more than 30 minutes after the departure from the red giants. 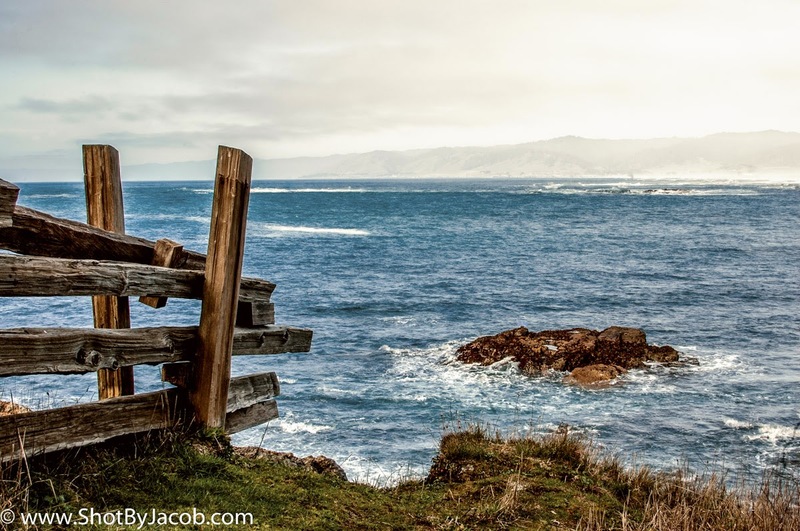 We came alongside a cove where a couple inhabitants called the ocean their backyard. To the south the shore was dotted with black rocks that stood tall like soldiers on guard. The beach was littered with driftwood, seabirds and kelp. There was a thick mist rolling in. We got out of the car to admire the scene and I took a few pictures. We were now on the famed Highway 1 and heading north. The first town we came to on the 1 was a charming little town by the name of Albion. 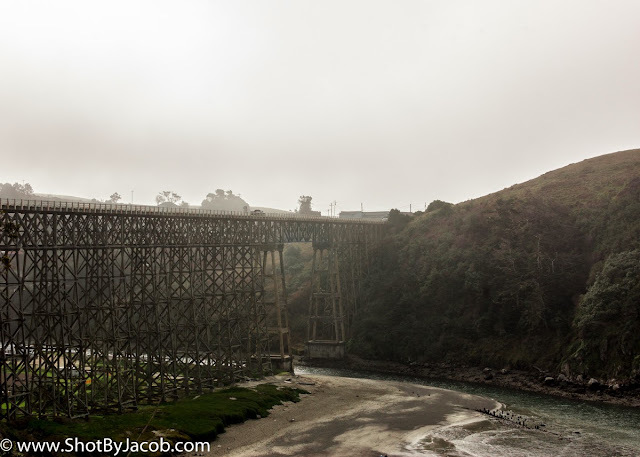 We crossed over the last wooden bridge in existence on the 1. The Albion River Bridge is wooden truss bridge that was built in 1944 during WWII. Its impressive height stands tall, spanning the gap where the Albion River and Pacific Ocean meet. With the fog pouring over the bridge it was hard not to imagine you were suddenly transported back in time, the quaint town whispering of its past with its small size and sleepy demeanor. The charming cottages at The Albion River Inn caught my eye, they were situated right on the cliffs with the ocean views flooding into them. A small restaurant gave it the perfect finish for a quintessential setting. 30 minutes of driving brought us to our destination city, Fort Bragg California. The city has roots in timber, famed tourist attraction The Skunk Train was in fact a rail built in the 1800’s used to transport the large lumber to the coast from the inland. The Skunk Train still operates but the cargo is now passengers eager to see the backland of the redwoods. However I was here for the beaches that Fort Bragg had to offer not the train. Our first beach stop was Mackerricher State Park. You don’t pay to go in so I wasn’t expecting much as far as upkeep or views. To my surprise I immediately saw photos I wanted to take. There was a raised wooden footpath that led you from the parking lot out to the ocean cliffs through some trees. 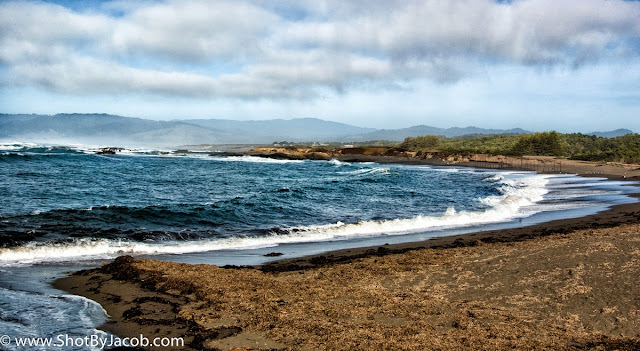 The first view I stopped at was a great vantage point of the sweeping coast and dramatic clouds in the sky. Since I was shooting a prime lens I could not zoom out and I couldn’t back up anymore so I had to shoot two photos and stitch them together in Photoshop to create one photo. As we continued down the wooden footbridge I noticed a couple that had climbed down onto the rocks to soak in the sights up close and personal. 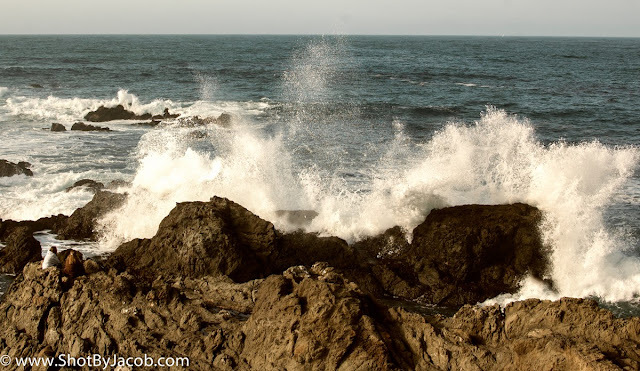 I got my tripod out, strapped my camera down, set the aperture and focus then waited for a large crashing wave. I left the couple in the shot to give a sense of scale of the wave rushing into the rocks. A little further up the footbridge came to an end, but I saw a shot I just knew I had to have. It was a scene with a fence flowing right through the frame, I knew I was going to utilize that as my leading line. It helps move your eye from the left of the scene into the middle of the frame, where the fence ends and the hills in the background take over, crossing your eyes to the right of the frame where you get grabbed by the rock and then once more by the cliffs ledge leading you back to the fence. I enjoyed taking this photo very much, there was a lot of thought put into it. I was happy that putting it into Lightroom allowed me to draw out the details through the fog of the hills in the distance. We packed up and headed further north. We pulled over at one of the many sandy parking areas where other beach goers disembarked. 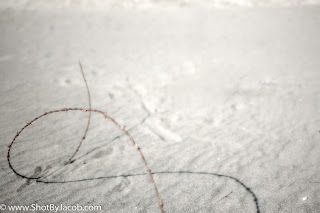 We headed down a winding trail through thick brush and then onto a beach filled with tall dunes. The tracks in the sand were evidence enough that we weren’t the only ones there, however we saw no one else. 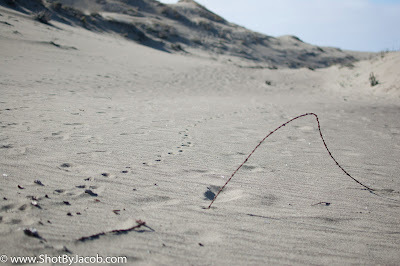 We climbed our way through the dunes heading west towards the ocean. When we realized how many hills of sand there really were we let go of the idea of walking all the way out to the ocean and instead sat atop one of the mounds of sand. We soaked in the ocean and let our travel melt away. I noticed the most interesting patterns in the sand. I had to get up and start shooting them. 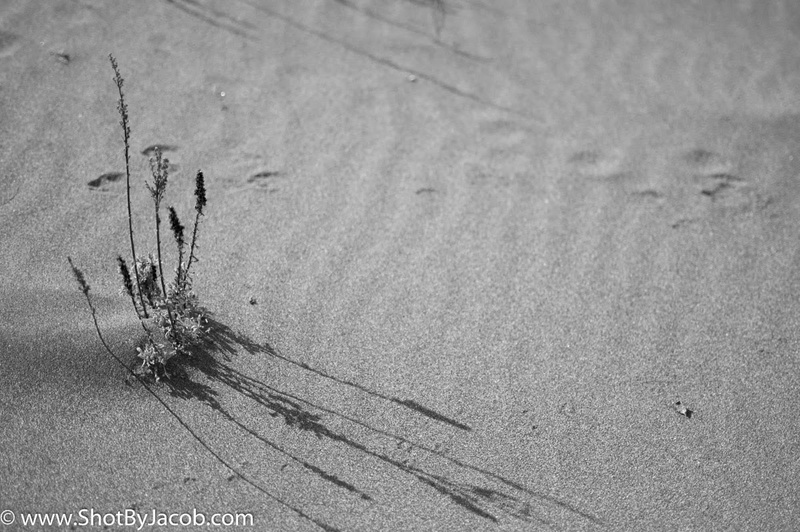 The more I shot the more I wanted to shoot the abstruse nature of the windblown sand. With such a focus on the abstract I began to approach my shots with a mindset of form and balance. I could more easily see the composition of the shot and made changes to my approach to the subject to create more appealing photos. 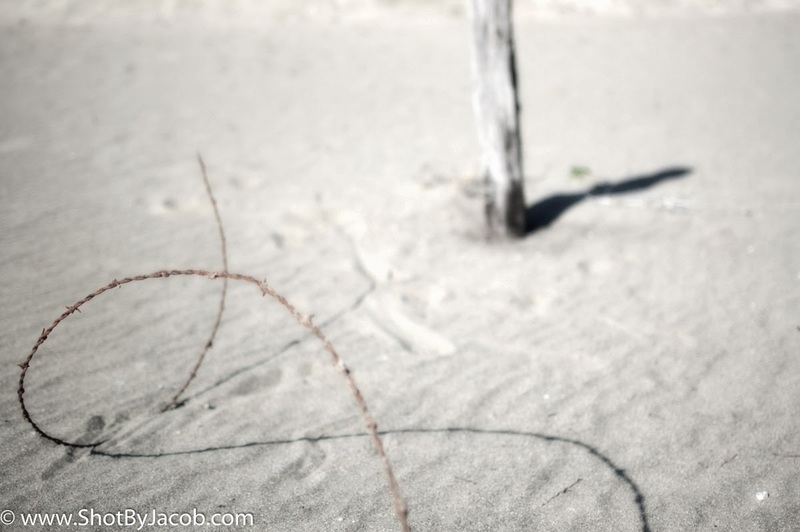 I came across a fence post sticking out of the ground with a rusty barbed wire winding its way across the top of the sand. My first few shots were not weighted correctly the horizon was not needed in the shot. I tightened my crop and deliberately shot a more balanced picture. 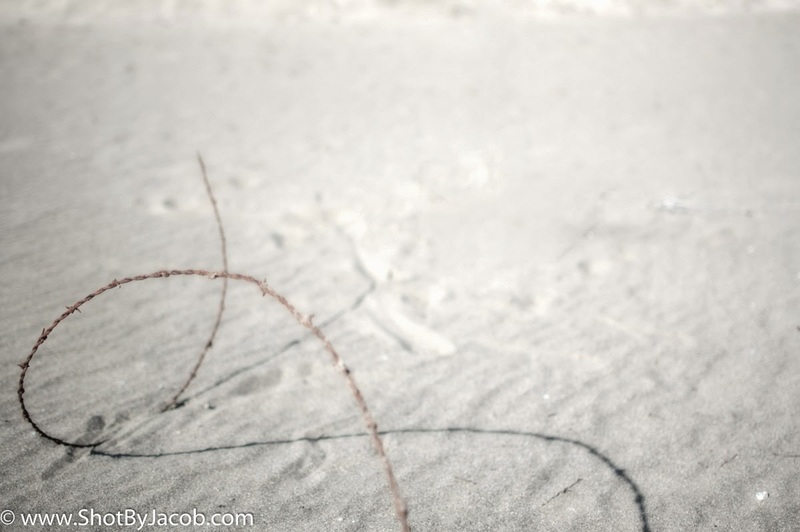 I began to see that although the barbed wire was an interesting subject the weight of the photo was off. It caused my photo to have an odd and uneasy feeling. Although the sand and the barbed wire are a good concept for a shot, the execution lacks terribly. There is a lack of interest in the subject and you wander throughout the frame looking for balance. The horizon with a bright sky also distracts your eye from the subject. The next few shot I took I decided to include a nearby post in the composition in order to bring a weighted balance to the frame. The lines in this photo are terrific. The movement of the wire and the playful nature the shadow convey in the photo work well. It leads your eye from the bottom of the frame into the center. The post is there to support the balance of the composition and add to the story the photo. Here I took the original photo and subtracted the post to show you how much better the composition is with it. Looking at the time I knew we had to be on our way in order to make our next planned appointment. I had booked us a horseback ride on the beach during the sunset and I was getting eager to start. After the trek back to our car and unloading the sand from our shoes we headed back towards the city. Five minutes later we arrived at Ricochet Ranch. My wife was so excited to learn of the plans. We saddled up and headed across the street and westward to the ocean. The path to the beach was through a bit of forest which drummed up the drama as we heard the sounds of the ocean getting louder and louder. We came out onto the beach with intense orange and red color in the sky signaling the end of another day. With the sun off our back left shoulder we rode along the black sand splashing up the surf, leaving hoof prints in our wake. When we reached the other end of beach 20 minutes later we turned up towards the logging trail and headed south. I saw a picture developing that I wanted to make sure I was ready for. 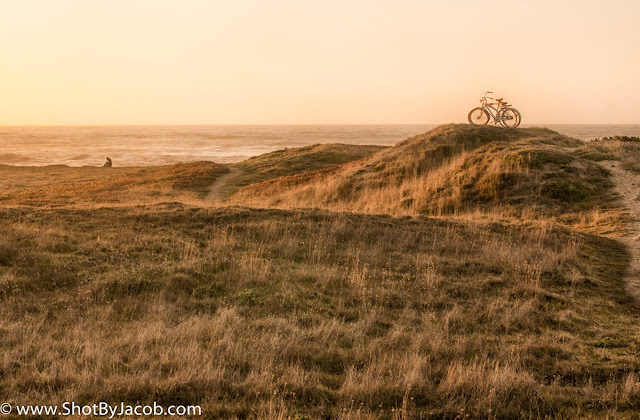 It was a scene of two bikes on top of a grassy dune pointed towards the sunset. It was almost as if they ascended the dune unassisted in order to take in the scene. I named that photo “Bikes have feelings too”. We arrived at our motel around dusk. The front office building was embroidered with softly glowing lights inviting us to forget our travels of the day. Our first impression sold us a promise of relaxation and comfort. We were greeted warmly by our host. After talking about photos of this same motel from the 70’s I found out that he is a direct decedent of the original owner. We talked more about the history of the property and of the town. I thanked him for his time, got our room keys and went to our room. Our suite had a balcony complete with deck chairs, my wife and I opened a bottle of wine and plopped down into them. That relaxation promise was being fulfilled. Enjoying the sounds of the ocean and the sight of the remaining sunset ended the rest of our day. The views were spectacular and we could not wait to wake up to them again the next morning.